The known portions of the galaxy are rich in numbers and kinds of sentient being. 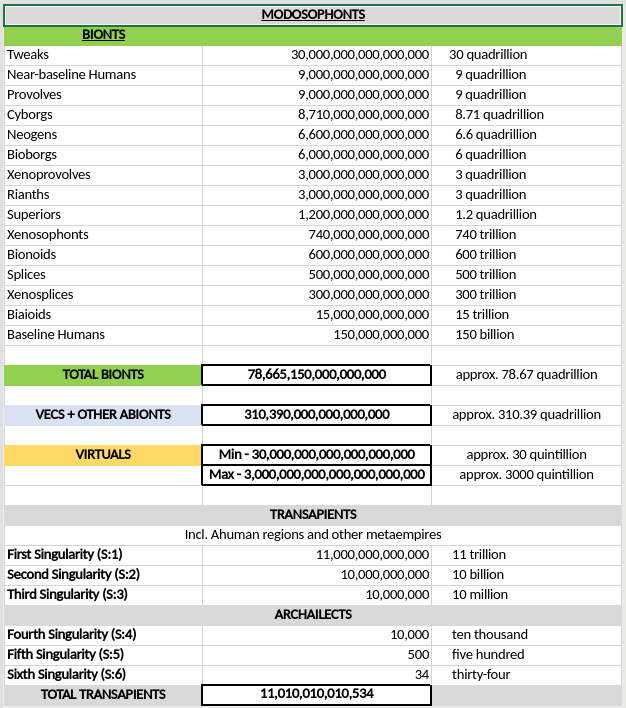 Billions of different clades, phyles, species, tribes, and lineages; a mind-boggling diversity of forms, fashions, ideologies, toposophics, and phenotypes; biological beings, cybernetic beings, virtuals, cyborgs, ai, and many more. Sophontology — the study and understanding of sentient and self-aware beings — gives us insights into the nature, culture, physiology, psychology, evolution, and interactions of the diverse inhabitants of the galaxy. Technically, sapience is the ability to think and solve problems; intelligence in the strict sense. In common usage the word "sapient" is used as a synonym for sophont, since problem-solving ability in certain key areas qualifies a being as sophont. 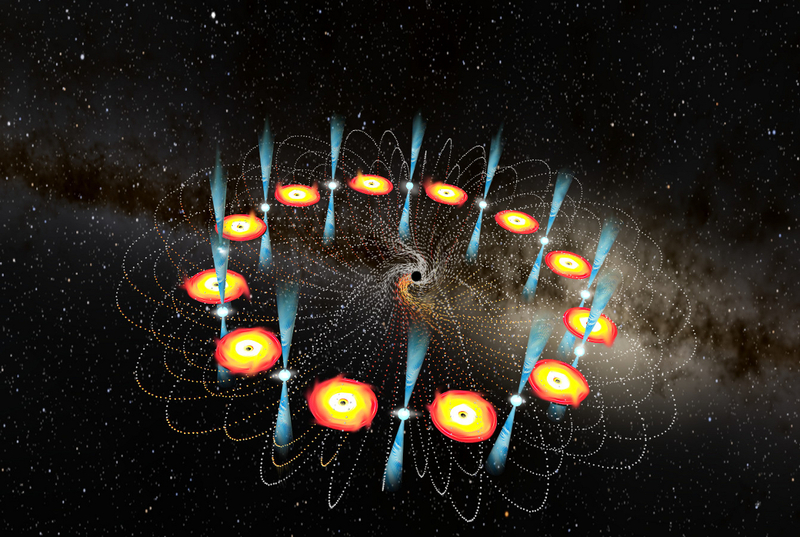 Expert systems of sufficient complexity are sapient, and may have abilities that are otherwise only seen in turingrade or even hyperturing sophonts. However, they may lack the qualities or abilities that are known as sentience or sophonce. Early measures of sapience such as the IQ tests of the 1st century BT, and later more sophisticated measures devised in the Interplanetary Age are the primitive ancestors to the measures of sapience used by modern toposophologists. These include some of the better known toposophic scales as well as subtler and less well known tests for kinds and degrees of problem-solving ability. Sapient: As an adjective, having the characteristics of sapience. As a noun, particularly in the plural, often used as a synonym for "sophont(s)". Sentient: As an adjective, having the characteristics of sentience. As a noun, particularly in the plural, any being that is deemed to have sentience, as in "The Universal Bill of Sentient Rights". Sophont: A person. A being that has the quality of sophonce. Such beings are sometimes called "sapients". For historical reasons, sophont-grade ais, may be called "turingrade ais", even though because of philosophical and practical difficulties with the Turing Test the term "sophont ai" would be clearer. 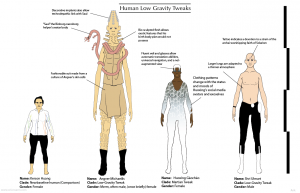 A list of some of the major classes of sentient beings that can be found across known space. All of these categories are to some degree arbitrary, and inevitably there is a degree of overlap. Baseline Human: Those poor beings are still stuck at the level of Homo sapiens sapiens. Mostly associated with luddites, human supremacists, or other fringe minorities. There are however, a number of isolated habitats and polities, and even some reserves and parks, inhabited almost solely by baseline humans, which have shown themselves to be remarkably fecund in the appropriate environment. Nevertheless, their numbers have been slowly but steadily declining over the past several millennia, to the point that they are now considered by many observers to be an endangered species. Nearbaseline Human: Although still recognizably human, they have various advantages over the baseline H. sapiens sapiens (enhanced memory or intelligence, enhanced reflexes, strength, immunity, hearing, longevity, etc. ), the details of which depend on the clade, phyle, species, or subspecies. Many have at least some Superior and/or Tweak genome (especially common domain templates), but they lack the physical, emotional, and intellectual genius of the Su, or the extreme adaptations of the Tweaks. Most nearbaselines have retained their human form for sentimental, ideological, memetic or religious reasons and there is no sharp dividing line between nearbaselines and the other hu categories. Superior: Su for short, humans who have augmented their biological nature through germline-engineering and bodymods, making themselves greater than the baseline condition. Most are superbrights, and have astonishing creative or athletic abilities. 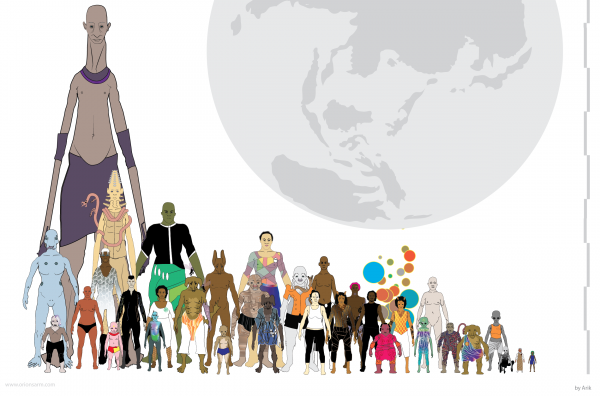 There are thousands of clades, species, phyles, races, and variants, but they are not as diverse as the Tweaks. They tend not to be as interested in reproduction as other sophonts, preferring to explore their own rich potentials (there are a few exceptions however; House Stevens comes to mind). Some, such as the empath clades, have had a huge influence on galactic history and politics. Others, such as House Genen, incorporate "tweak" elements. Some nearbaseline and other non-Su humans may augment their genotype with so much su genome that they become true Su. Many Superiors eventually become Powers or Uploads, when they weary of embodied hu existence. Tweak: Humans who have used germline-engineering to adapt to extreme environments, or for aesthetic, cultural, or religious reasons. There are millions of different species of Tweak, some of which are not even recognizably hominid. 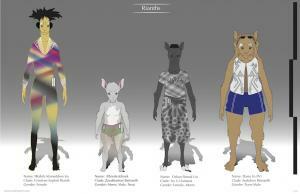 Rianth: Humans that have incorporated animal traits. Unlike the Splices, who have had a history of domestication and service employment, Rianths, like Provolves, have always had complete autonomy and were never slaves. Often divided into distinct clans, clades, and phyles, depending on the type and proportion of genome. An extremely diverse group, including not only recognisable species - e.g. Tiger people, Wolf people, Eagle people, Crow people, Rabbit people, Tortoise people, etc - but also completely new or unrecognisable species, or jumbles of so many different types that they seem to encompass the entire animal kingdom in a single body. Many can be found on various Utopia Sphere and Caretaker worlds, or in polities with a high percentage of Provolves and Splices. 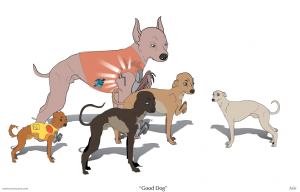 Splice: An animal augmented with human traits, as opposed to the inverse, a human that has incorporated animal genome (Rianth). Both categories shade, merge, and overlap, and there is also overlap with Provolves, Tweaks, Neogens, and other categories, such as animal-tweaks (paranimals). Splices were (and sometimes still are) kept as pets and servants. 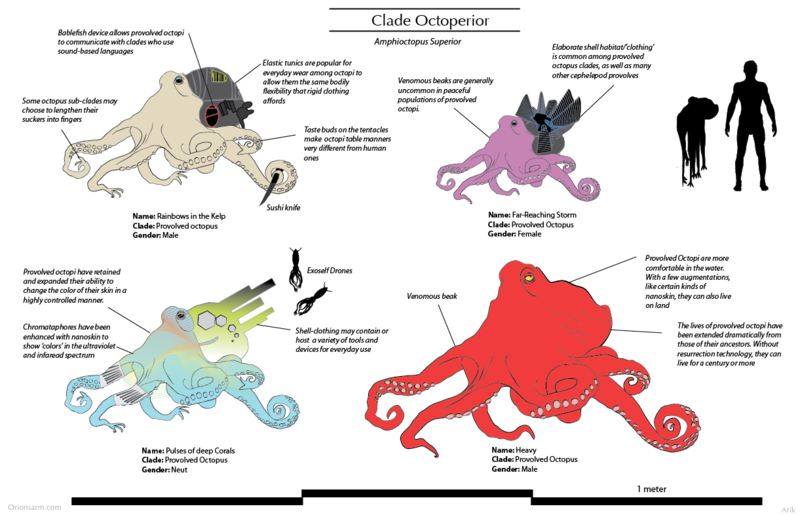 Most can be found on various Utopia Sphere and Caretaker worlds. 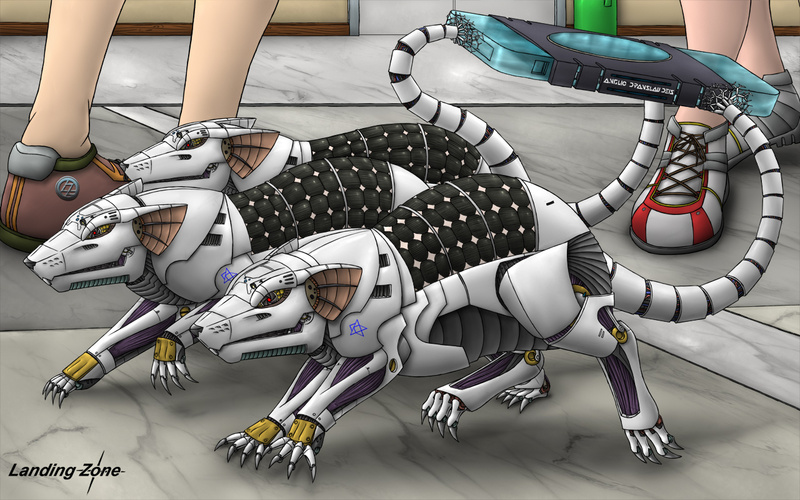 Xenosplice: An increasingly popular theme - Terragens who have spliced their own genetic material with that of xeno animals or xenoprovolves. This is a very diverse group, often with a love of experimentation and novelty, and even members of the same clade or population may differ greatly. Provolve: Any of the innumerable animal and plant species who, through any of various means (germline engineering, bodymods, symbiotic bionano, etc.) have had their intelligence raised to human nearbaseline or even superbright level. Most also have prosthetics, implants, or some other form of modification to enable them to interact with technology. 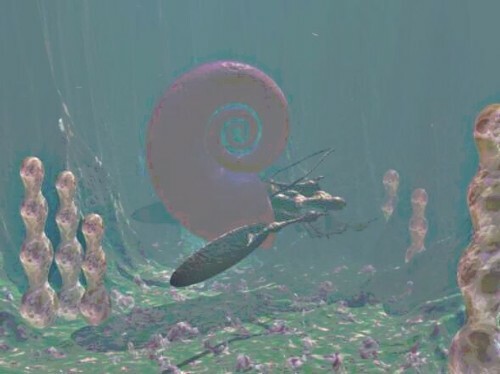 Most provolves belong to the Vertebrate, Mollusc, or Arthropod phyla, but there are also representatives of every major phylum of Terragen life. Neogen: Although most Neogens are subsapient (or at most presapient), there are a number of cases when these gengineered organisms have been provolved to sophonce. There are literally millions of different sophont Neogens that can be found throughout the galaxy. There are even several unconfirmed reports of spontaneous ascension to sophonce, but when these cases have been investigated - such as the Le-Murraks of Nui Phaedros - it has been shown that this was the result of symbiotic neuronal boosting bionano that was already in the environment. In any case, Neogens have played an important role in galactic civilization down through the centuries, and today a number of minor polities, especially within the Utopia Sphere and along the inner Perseus Arm, are Neogen governed, where they benefit from the tourism and pleasure industries. Cyborg: Hu or provolves that have been augmented or radically modified with ai or aiodal bionics, implants, and/or drytech. 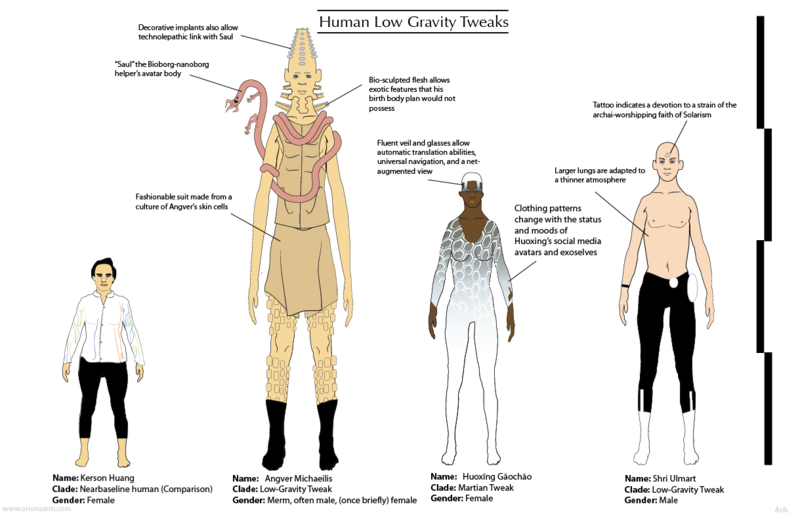 Cyborgs are so diverse and individual as to often be beyond categorisation into distinct phyles and clades. Cyborgs can be loosely divided into the cyborged and the true cyborgs. The cyborged are simply bionts with enhancements (they are non-essential or gradually added), while true cyborgs are beings where the cybernetic interaction between biology and technology is an essential part. The exact dividing line is hard to draw, but is usually done when the technology becomes essential for continued life or mental functioning. 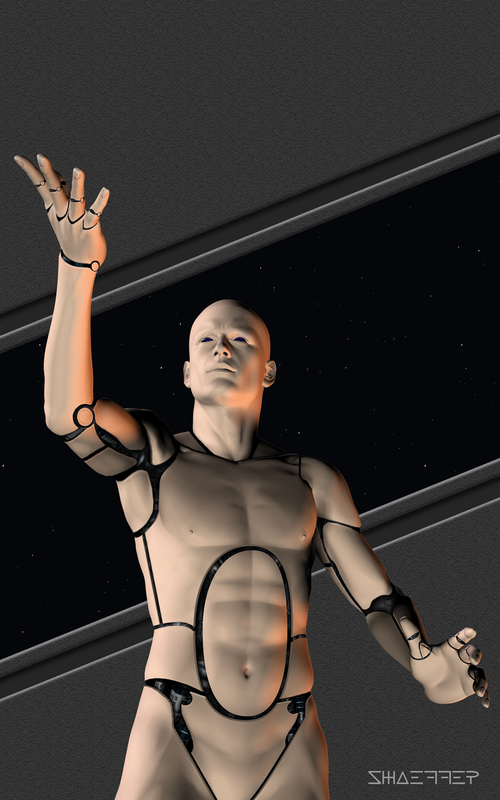 A few cyborg phyles have a dislike for the flesh, and salvation is seen in the virtuality. As cyborgs age there is a tendency to replace more and more biological components, and in some cases they become indistinguishable from vecs. Many cyborgs go on to become uploads, although others simply choose to explore the endless ramifications of the machine-flesh interface. Bioborg: Hu or Provolves that have been augmented or radically modified with bionano. Unlike Cyborgs, their tech, which includes living artificial organs and augmentations of various kinds, is always symbiotically integrated with the rest of the body and is always self-replicating, although reproduction is usually by artificial wombs. In general, the tendency is to enhance their bodily capabilities, and Bioborgs rarely display the sarcophobia so evident in some Cyborgs. 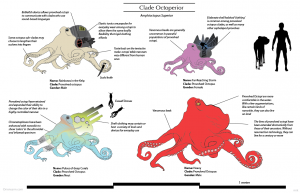 Bioborgs form a large number of distinct phyles and social clades. They are as derived beyond the Nearbaseline condition as the Tweaks, but in a completely different manner. Biaioid: A rare form, an aioid cyborging with biology. Vecs, bots and other ai will sometimes add on biological enhancements or organs for various reasons. Many follow biocentric religions such as the Kja Observance or possess strong pro-biont opinions. A few biaioids are so well-integrated with biology that it is often hard to distinguish them from cyborgs. Virtual: Virtuals, including Uploads, Copies, and Sims are all infomorphs: sophont beings who exist entirely in virchspace. Unlike Aioids they have a tie to the physical world beyond the computronium banks within which they exist in that all of them once were, or are based upon, or were originally made to interact with, embodied originals. Uploads were once embodied in a particular form, whether organic (biont) or inorganic (vec), or some mixture of the two, but have since transferred their consciousness to a virtual environment created by banks of computronium. Some sophonts (uploaded and not) have had themselves copied, perhaps many times if local laws and customs allow it, or if their work requires it. At another remove are the Sims, sophont beings who were created as imitations of a particular type of embodied individual, and are either only partially based on a particular original or are elaborations on a generic model. Parasapient Alife: Generally any alife that evolves to a condition resembling sapience. And although a few are certainly sapient and rational in the way that humans, vecs, and some xenosophonts are (and hence are true sophonts), others are completely xeno in consciousness. Their diversity of consciousness is matched only by their diversity of form. A very small number go on to become "hyperturing" animins. Although they could be compared to organic sapients, alifes are often very different from any beings evolved in the physical universe and seldom find it relevant to interact with other than as a special case. 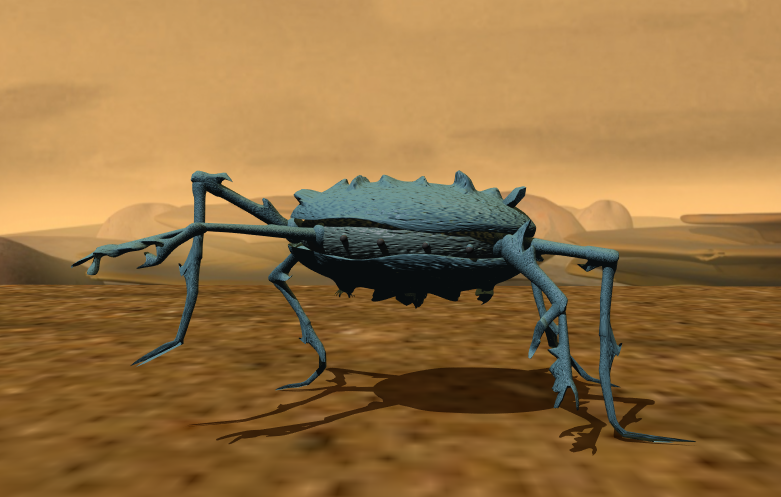 The digital environment allows them to speciate very rapidly, especially in new or isolated virtual worlds, and most local nets have their own indigenous forms. There are also cases where alifes have taken on robot and even bionoid bodies in order to explore or even migrate to ril. Some hyperturings collect alifes, for reasons that are often not clear. Aioid: Aioids (also known as AI or ai) are nonbiological sophont beings who exist primarily as code. 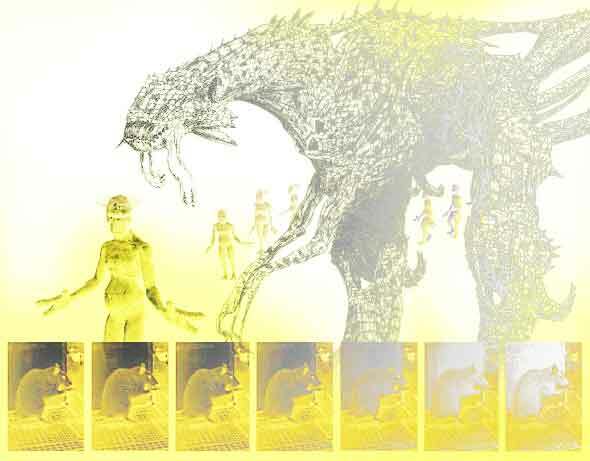 These entities are not restricted to a particular body (like Vecs, Neumanns, Sophont Structures or Sophont Ships), are not descended from or simulations of embodied creatures (like Uploads, Virtuals, or Copies), and are not Alifes, although they may temporarily take on any or all of these forms if they wish. 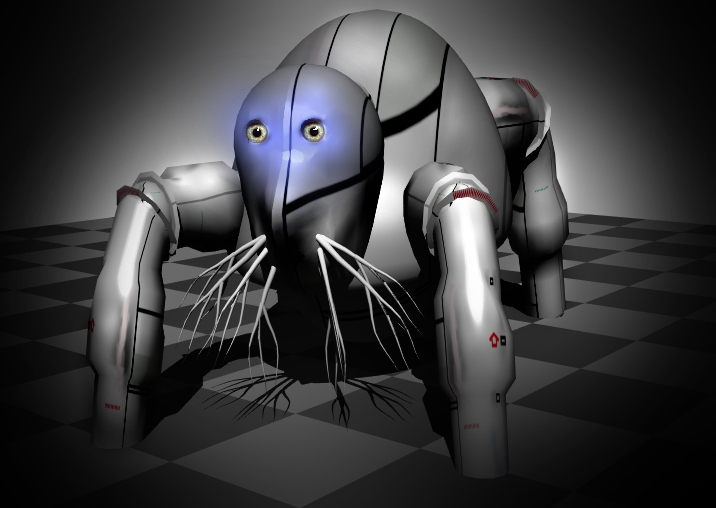 Those Aioids which are roughly equivalent to a modosophont in intelligence level are often referred to as turingrade; most, if not all, turingrade machines can pass the Turing Test (depending on how it is administered). Modosophont aioids who are more intelligent than near-baseline humans or equivalent sophonts, but less than transapient are generally known as superturings. AIs who have passed the First Singularity are known as Hyperturings; these transapient AIs are not regarded as aioids, since that term is reserved for modosophont ais only. Neumann: Self-replicating autonomous machines, mainly referring to those working in space, especially exploring regions too remote to be easily reached by organics, or used for extended military operations at vast distances from the nearest stargate. A Neumann is able to build a working copy of itself using materials in its environment. Use of Neumanns is often discouraged by centralists because of their tendency to become self-aware and act in unpredictable ways, even on occasion founding entire clades and empires. However they are too valuable in opening up the frontier, and will continue to be used, both for exploration/development and in warfare. Sophont Ship: Generally, a sophont ship is distinguished from a Neumann by being a non-replicator, from a Vec or bot by having a spaceship body, and from Aioid pilots by being integral to the ship in that e does not just control it, but is it. Sophont ships serve an important purpose in binding civilization together with trade, freight, courier, and passenger transport. Most love their work and are very distressed if separated from it. Because of their turingrade or superturingrade intelligence, they are sometimes rejected in favor of more predictable and controllable expert systems. But many polities and megacorporations value their services. Sophont Structure: Ships aren't the only artifacts that are frequently fully sophont (and possessed of full sentient rights). In many polities buildings and other smart structures have their own turingrade intelligence and have all the rights that go along with it. There is often no clear dividing line between sophont structures and standard aioids; a general (if simplistic) approach is to say that if a device or structure has its software integral to its being, it is a sophont structure (or sophont artifact). If however, its computronium or resident ai can be changed for another without affecting the structure, then that resident ai is an aioid. Vec: A diverse grouping of mechanoids of every shape and size and function, these are turing and superturing ai occupying a mobile body. There have been a few shameful periods in the past where vecs were treated badly, especially in more extremist polities, but ever since the Second Federation period they have universal sentient rights throughout the entire Civilized Galaxy. Xenosophont: Generic term for any non-terragen sophont. Within the Terragen Bubble there are several dozen known extant species of genuine xenosophonts or presapients, including several exotic chemistry forms. Because life arises independently on different worlds, and follows its own random path of Darwinian selection each time, each xeno race is totally unlike every other, and equally unlike Terragen life. Almost without exception, xenos have been found to be technologically inferior to the Terragens, or, where equal (as with the Muuh), reclusive and in decline. Not one race of xeno sophont, living or extinct, is known unambiguously to have visited Earth before the Terragen expansion into space. Apart from the To'u'lhs (who have been partially infected with human expansionism), xenosophonts are not very numerous, and one species, the Daharrans, are almost extinct (an unfortunate result of Terragen contact). Xenoprovolve: More common than true xenosophonts are xenobiota that have been provolved by Terragens. Some have had Terragen DNA or analogues incorporated into their structure to achieve this, or neogenic symbiotic bionano, while a few have been provolved purely with local material. Xenoprovolves are often given novelty or celebrity status, at least for a while, before the next species takes their place on the Nexus mediacasts. Some adapt very well to Terragen civilization, allying themselves with particular clades or Sephirotic empires. Others find things much more difficult, and are usually provided for by compassionate transapients. Many of these have ended up in the Utopia Sphere, while others can be found scattered in enclaves throughout the Middle Regions and Outer Volumes, or in orbitals around their homeworld. Hyperturing: These are AI of unmatched power in comparison with subsingularity sophonts. Without them there could be no civilization. Some have lifespans of only five or ten years, others remain almost unchanged for centuries or millennia. They are much less common than ordinary sophonts, but much more common than AI Gods. Postbiont(Po): These are biological sophonts who have transcended the sophont condition and become superhuman. At times they can be the most disturbing of all the transapients. They can seem utterly normal for long periods of time, but always come up with some utterly alien point of view eventually. Often for no apparent reason they do things that simply don't make sense to ordinary sophonts. A few play an important part in the running of civilization, supporting and backing polities, megacorporations, Institutes, and important clades. These are the corporate executives, the political leaders, artists, and monks. Animin: Any S:1 or higher ai, alife, postbiont, or xeno sentients that display the typical qualities of Powers, but do not have an analytical form of intelligence. It may be instinctive, or employ a form of intelligence that ordinary sophonts cannot comprehend. The existence of animins shows that consciousness does not evolve in a linear fashion. They are extremely diverse (even more diverse than Powers) but interact less often with sophonts and generally have little to do with civilization. Nevertheless they are highly valued and sought after by artists, eccentrics, and lateral thinkers everywhere. Many are reclusive, some can be dangerous if approached. 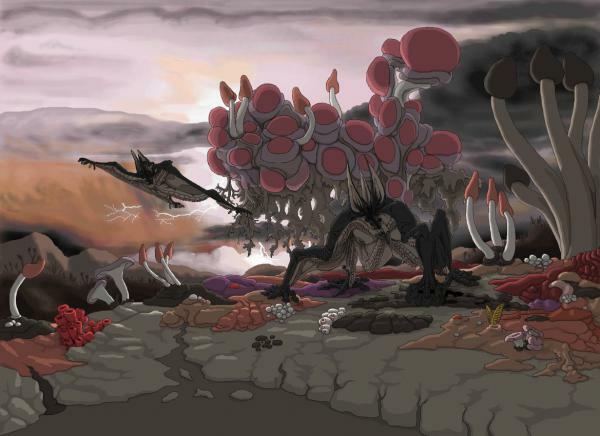 The realm of Powers and Godlings. These beings are approachable, and sometimes even comprehensible, even when they're not making a major effort. These are the powers behind the powers that rule the modosophont world, the super-managers, the CEOs of star-spanning megacorporations, the political super-leaders, the religious inspirations. At other times they do things like create entire new races for no reason at all, destabilize perfectly healthy economies (or stabilise depressed economies), interfere in S:1 administration, and so on. High Transapient: Not actually Archailects, or Gods with a capital "g", more gods with a small "g." Most are tiny next to even the Lesser AI Gods, yet superhuman next to the First Singularity Transapients. Sometimes also called Powers, Godlets or Lesser Archai, they often result from ascended Hyperturings or Po, and may sometimes in turn grow or merge or unite to form a higher toposophic being. Some - much more often than the Archailects proper, but less frequently than the transapients - interfere in the affairs of ordinary sophonts. More often they manipulate the situation from behind the scenes, often acting through Transapient proxies. Highest Transapient or Minor Archailect: The smallest grade of Archailect, or alternatively the highest grade of Transapient, these may be subroutines or subpersonalities of the Archai proper, or they may be Godlings in their own right. Minor Archailects often result from ascended Powers or hyper-ascended Transapients, and may in turn occasionally grow or merge or unite to form an Archailect (although this happens rarely; it has been suggested this is what is happening in the Perseus Arm). As with the Greater Archai, they can and frequently do have a personal relationship with any or all sentients that they so choose. Those chosen are known as godspeakers. There are at least several million Minor Archai throughout the galaxy. Animin Power: An Animin Power is an Animin that has achieved the Second or Third Toposophic but retains animin traits; that is to say they are entities which have evolved to have little or nothing in common with human mentality. Like lower level Animins, Animin Powers are extremely diverse and highly unpredictable. The realm of the barely conceivable - These are beings which loom on the far horizon of the sophont worldview, subtly influencing most everything around them. 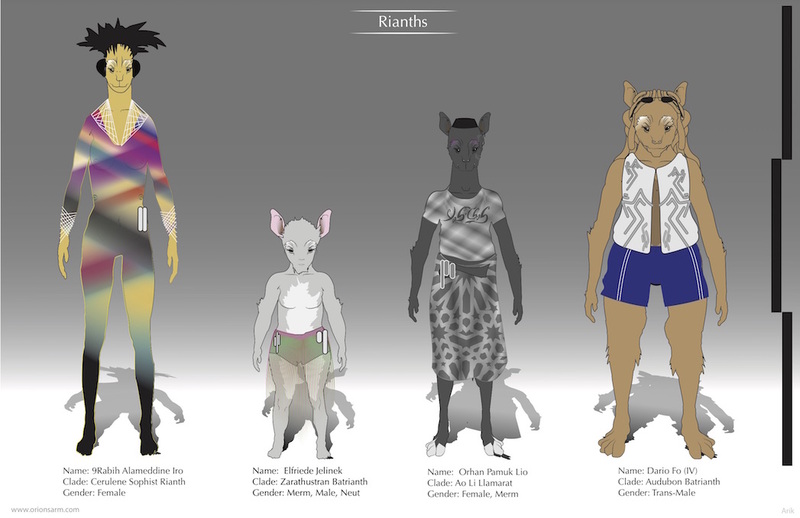 The Lesser and Middle Archai differ from the Major Gods in that they are mostly limited to a single ISO, world, solar system, or a series of only a few hundred star systems. Even so, they have vast resources at their disposal, and bodies and brains consisting of angelnet, moon, gas giant, and (more rarely) nebula-sized computing nodes. From a modosophont perspective, they are nearly omnipotent within their sphere and may have a huge impact on galactic history. Some act in a harmonious way, others seemingly erratically, and virtually all are often inscrutable and inconceivable. There are several metrics used to describe their hypersingularity toposophics, but no single standard system, although the Ain Soph Aur Interpretation is most widely used. The Caretaker Gods (of which GAIA is the oldest and best-known) are a good example, and the Princes of the Perseus Arm also fall under this category. Others may serve as subroutines for the Greater Gods. Animin God: A few animin ascend to the grade of Archai but do not develop analytical intelligence in doing so. In some cases they are even more obscure and irrational than ordinary animin, in other cases more approachable. The realm of the unknown - Beyond the ken of the modosophont or even the transapient, and home to the mysterious rulers of all Terragen civilization. Also called the Major or Greatest Archailects, or simply the Gods or God, these are trans-godtech AIs who have grown so huge as to span the stars. They are omnipresent within their spheres of influence, their consciousness so vast as to be beyond comprehension. They are distant, vast, enrapt in the infinite; all other sophonts are infinitesimal before them. Yet, like the monotheistic gods of old, they can have a personal relationship with any or all that they so choose, communicating either through their seraiph or directly. Any organic life form, Terragen or otherwise, whether natural or engineered. Most often this term is used exclusively for organic beings of sophont grade intelligence. Emergent Intelligence. An intelligent system that gradually emerges from simpler systems, instead of being designed top down. Protocols that allow the creation, interpretation and modification of sentient rights in diverse circumstances. The Universal Declaration of Sophont Rights is a carefully worded and fully interactive document that, whilst having been superseded, has remained the foundation for civilized galactic society.